The Student Senate was founded in 1921. For many years, this organization acted as a provider of student activities and events until Student Activities Council took over those duties in 1968. Today the Student Government Association (SGA) is responsible for chartering new student organizations on campus. It is also the organization where the voices of the students are most heard. Senators from every university sponsored organization are represented on the SGA. 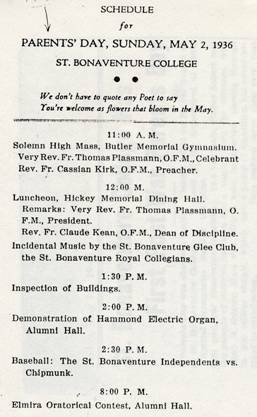 One accomplishment of the early Student Senate was to found an activity called "Parents Day" in 1936. This brought the students' parents in to the College for the day for lunch and an afternoon filled with relaxation and recreation. 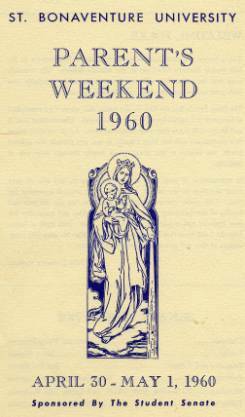 In 1960, the Student Senate changed Parents' Day into Parent's Weekend. This made the events last two days, instead of one. The first annual Parent's Weekend had events like a talent show, and music, courtesy of the University Band and Glee Club. The goal of the weekend, according to the Student Senate, was to "sincerely hope that the added time will afford you an especially enjoyable time with your son or daughter here at their campus home." For more information about Student Government follow the linked text.